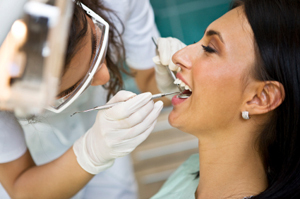 Scaling and Root Planing is a normal dental procedure is very important for patients prone to gum disease. As you may know, gum disease is caused by bacteria buildup, or plaque. Plaque produces acid which breaks down teeth, leading to decay and tooth loss. By removing the plaque, you will have healthier teeth that are strong, white, and free of cavities. Removing the plaque will prevent bad breath, decay, and infections. During a normal dental cleaning, we perform scaling and root planing to get rid of the plaque that has hardened and is impossible to remove with just a toothbrush and floss. Patients in need of more extensive deep cleaning may need to have scaling and root planing done over the course of several visits. Visit our Scaling and Root Planing page for more information on the procedure.